The exhibition reminded me of those re-enactment club-fanatics in the UK and other parts of the world. This exhibition is in a way, a re-enactment, separate from the contemporary and post-modern art complexity. It doesn’t quite feel or look like contemporary art, or does it? Like all fanatics, attention to detail is everything. Attention to detail gave us the stunning big screen re-enactment in Steven Spielberg’s Saving Private Ryan, the battle of Normandy. Such attention to detail impresses even non-fanatics. 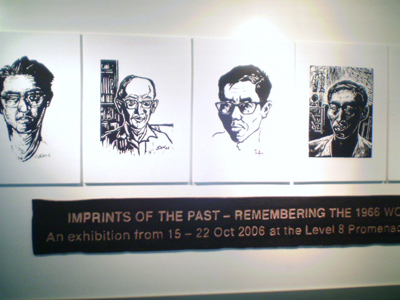 This Imprints re-enactment seems to be symbolic only in numbers and dates, six woodblock print artists, and forty years on since the predecessor exhibition, held also at the National Library. It is more symbolic because from an art educator’s point of view it potentially traces and plugs the gap between art, illustration, where perhaps the only difference to fine art is the commission paid to the artist. Woodblock prints from the fifties and sixties embody an alternative to the status quo of a Nanyang Style as the only representational art style (and medium) of first generation Singapore artists. It is a stark contrast to two Singapore Art Biennale works, also located in the same building. The former delves into the consciousness of artists 40 years ago, the later muses the public and it’s ‘Shock of the New’ today. Imprints doesn’t have the visual spectacle of Jeremy Deller’s Battle of Orgreaves, a 1984 coal miner’s strike re-enactment” (2001), in which the artist didn’t necessarily claim as (performance) art on a grand scale. If illustrators get their cards right, they could learn from these masters, and create a new retro illustration style, one that ‘draws’ by reduction rather than addition, just like laborious sculptors who toil on their marbles. The beauty of woodblock prints should still wow illustrators today. The understanding of principles of art and design, draftsmanship, and technique are not dissimilar from the computer and wacom tablet. It is however, more time consuming and requires the utmost attention as mistakes cannot be undone with a mouse click. In some sense, there is a regard of awe and respect for these woodcut masters, the illustrators of books and newspapers of their time. Hence, there are two areas to consider this exhibition. Firstly, printmaking as a technology embraced since (Medieval) Albrect Durer’s and the Chinese Diamond Sutra (868A.D.). Sadly, woodcut print as a technology is about as exciting as playing Atari 2600 amongst xbox 360, using MS DOS versus using windows XP. Secondly, the romanticism and realism-content of these marvelous black and white prints. Like what Cheo Chai-Hiang said in a panel artists’ talk elsewhere, one may be interested to see those that are not exhibited, those that reflect the more turbulent times of nation-building which artists struggle to make ends and artistic integrity meet, which unfortunately is not the scope of the Imprints exhibition here. That would have made the show a better re-print of the past, beyond remembering another exhibition but framed in the context of contesting the hegemony of A Singapore Art History, where few 1st generation artists are canonised. The exhibition is one of the better shows at NAFA gallery, with a rigorous conceptual raison d’etre, several exemplary modes, presentations and representations of the ubiquitous process called ‘drawing’. Artists here do not simply retreat, taking a step back to examine some of their time-honoured practices, they experiment with drawing. Artists love to doodle. Drawing is often claimed as the most fundamental products and processes of art making. Drawings capture imagination, and propels it; often a state of transition to more finished works. What is considered finished? In drawing and indeed in other art forms? Drawings here, are conceptual, some child-like (not childish), others embellished in techno-fever leaving the viewer bemused. Drawing is fun and engaging, depending on the frame of mind, artists and young children , mature artful audiences and casual art-goers alike. 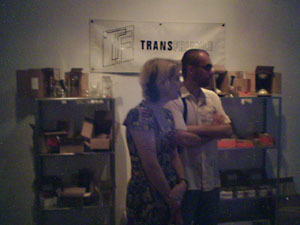 The exhibition explores various artist’s relation to the word. Some chose to explain and describe the word as a verb, and display the processes of drawing and the by-products, such as Andrea Weschler’s ‘Round the Drawing’ or Tang Ling Nah’s ‘outside, within, smudge and swimming in charcoal‘ (I’ve probably got the title wrong and will fix it when i can). Some see drawings on paper as what they are, scribbly lines on delicate paper, and the meaning imbued only by the viewer. Joshua Yang’s hardcover book compilation of 700 drawings by students of Pathlight School seem to suggest that as I hurriedly and guiltfully flipped careless through it. Others extend the meaning of drawing, pushing the boundaries of drawing in concept and material, especially seen in Hong Sek Chern’s ‘Automatic Drawings with Form’ series. Here, Sek Chern abandons her Chinese traditional ink, award-winning grid formula for an experimental piece with enjoyable results. It is raw, like 3-Dimensional doodles in space, forming an uninhabitable architectural model. I suppose the viewer will get the sense that there is no fix model to drawing – you can draw and shade from light to dark or light to dark; you can draw a line on the landscape by walking back and forth countless times to make a Mark (Richard Long); you can perhaps un-draw, just like how Robert Rauschenberg erased Willen De Kooning’s drawing in 1953, to perhaps suggest the process of mark making and mark-negation, in destroying something you create something new. Perhaps we will all sharpen our minds and pencils a little, drag that cartridge paper out from the store or steal napkins from the next take-away to indulge in our little imaginations, withdrawing from the real world only to exercise the next step forward, stronger and refreshed. The (free) catalogue is a must have. Till 2 November, NAFA Gallery 1 & 2. The work by Patrick Beaulieu ‘TRANSFRIABLE – Lost Docks’ held the capacity to intrigue the viewer with the results of shipping fragile objects across the globe. The works strike a chord of existentialism if one choses to associate it. The work could be about deception of facades, seen in the need to call-yourself-a-company artwork. The artist tasks himeself to seek clients to ship things across the globe, and he replaces these with material that are a lot more fragile and breakable. 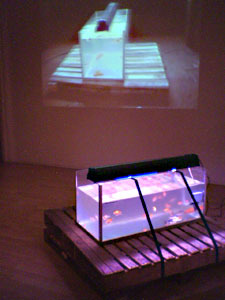 In one work, in a situationist fashion, the artist tried to interject an event, and raise curiousity about shipping breakables, and in one work, goldfishes across the ocean by enquiring at local aquarium-shops and shipping companies. Which could probably be done through air-freight, as demonstrated by Qianhu, a Singaporean global exporter of ornamental fish. But the point is, can an artist do it? To many, perhaps it isn’t important whether ‘why’, but ‘how’. These fragile objects consisted of glass, with a nut or bolt in it with ridiculously little packing, or Chinese porcelain with an equally daunting metal object placed within it. Some objects are broken, some surprisingly survived. One can’t help but feel a sense of awe for these solitary journeys taken by these objects, and their the ominous impending danger. One feels lesser towards the artist, when he threatens to ship goldfishes, in a fish tank in a container where temperatures could possibly rise to 60 degrees centigrade. His interest in the fragility of displacement, both metaphysical and physical first saw light here, where he had shown a video, and the actual tree that was shipped from Canada, to PKW several years ago. I would say his interest is in stretching the relationship between people,objects, animals et al. These objects could also represent emotions, or per chance the human mind. Emotions are displaced by a flux of events that we embroil ourselves in the everyday – we sometimes get frustrated that things are not going our way, and that we are not in total control. When we do get frustrated, we want to get away from the source of that frustration. These distractions, mental journeys or physical vacations one take or task, are like Patrick’s seemingly meaningless tasks – shipping worth-less objects which perhaps only makes good sense to the (decision) maker. Survival of the objects give us, the viewer a little sense of satisfaction or emotional reward. Perhaps as an observer and not participant, we get to choose which little bits of the exhibit to feel joy for.